One random afternoon, over wanton mee and teh peng with the Guru, i suddenly thought of all my years doing agility with Chester and how his retirement has always been looming at the back of my mind. Truth be told, i was very envious of all my other Smartdoggy classmates with much younger dogs, knowing that their dogsports journey had just begun while sad to say, mine will come to an end soon. Lucas offered me a practical solution of getting another dog so my my agility career doesn't have to end as Chester ages but i refused because i've always been a one-dog person. 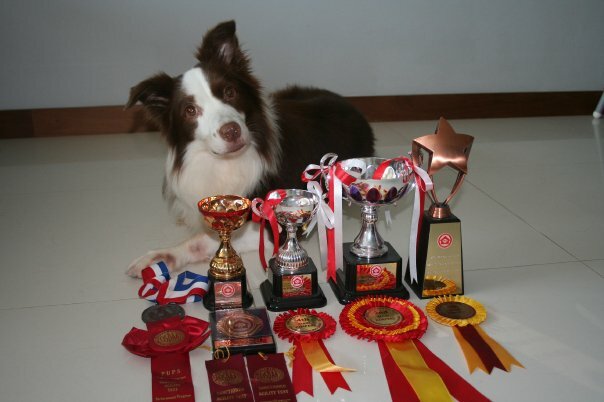 Moreover, agility has always been the special something between Chester and I, him being my very very first agility dog and us beating the odds to achieve little victories along the way. I cannot, and i repeat, CANNOT as much as i try to, imagine myself training and trialling with another dog! Yes, i am that rigid. I still remember the word Lucas used to describe me when i vocalised these thoughts to him. He said i was a "faithful" owner - which was highly amusing because you only hear people talk about faithful dogs and you almost never hear anyone saying that an owner is faithful to his dog! "When Chester is no longer fit to do agility anymore, why not consider doing obedience with him? If he's older and mellower, why not let him become a therapy dog? If he's not keen or if his health is failing, just play with him once in awhile, just sit around with him and chill out...."
And the words that hit me the most were, "A dog's career will never come to to an end, unless you stop loving him and stop doing things with him, you know?" So here am i, sitting on the couch, anxiously waiting for Dr. Choi to let me know if Chester's GHP and urinalysis is clear. The physical exam this morning was uneventful, no heart murmur or other significant findings, except for his yucky teeth which i will fix soon! It is my responsibility to make sure everything's good before i put him through anymore training and trialling. The optimistic person in me hopes that Chester and I still have a few more good years on the field before i hang up my Salomon for good, but i know that eventually, the day will come when my agility journey with Chester will come to a permanent end. And till then, when that day comes, I will think back and remember the wise words the Guru said on that random afternoon over wanton mee and teh peng. And i will walk away knowing that as long as i have my faithful dog by my side, it's never the end.